When setting up Execu/Suite for the first time, start with the Parameter Record. The Parameter Record contains various settings to determine how Execu/Suite functions, giving you flexibility. Go to Manager/Setup > Hotel Control Files > Setup > Parameter Record. You should consult Execu/Tech support prior to editing any field in the Parameter Record. The Parameter Record is divided into four sections: Property's address; Reservations/Front Desk; Night Audit; and Other. Two buttons at the bottom of the screen open new windows: Print Options and Passwords. The System Options button is for older systems and is no longer applicable. "Property's Address" will print on your confirmation letter, registration form, folio, and direct bill customer statement. Thirty characters will print for each line. The address may be in any format. "Last guest folio number" sets the next sequential folio number and should never be changed by you once you have started using Execu/Suite. "Last confirmation number" sets the next sequential reservation confirmation number and should never be changed by you once you have started using Execu/Suite. "Last cancellation number" sets the next sequential reservation cancellation number and should never be changed by you once you have started using Execu/Suite. "Payment to calculate at check-in? (O)ne day, (E)ntire stay:" determines whether the amount of room and tax charges for one day only or for the entire stay will display on the check-in screen. Enter O or E in the field. "Ask 'Post payment' at check-in? (Y)es, (N)o, (C)ash only" if set to Y will pop up a "Post payment now?" prompt for all payment types at completion of the check-in process. C will display the prompt for cash payments only. N will not display the prompt. NOTE: When the prompt displays, users may answer No to the prompt and continue the check-in without posting payment. NOTE: You should not set this to Y if your policy is to preauthorize credit cards at check-in. Credit cards that are preauthorized will be charged at check-out and should not be posted at check-in. If you preauthorize credit cards, you should set this field to C (for cash payments only) or to N (not to prompt, regardless of payment type). "Require credit card preauth at check-in? : may be set to Y, N, or X. It should be set to Y if your hotel's policy is to preauthorize a guest's credit card at check-in if a credit card payment type is entered in the "payment type" field on the check-in folio screen. This will force the user to preauthorize a credit card and eliminate the error of allowing a guest with insufficient credit to pay for the stay. Set the field to N if you do not require a credit card to be preauthorized at check-in or if you charge the guest's card at check-in (as opposed to authorizing only). With the N setting, you will see a prompt, "process credit card?" at check-in if the payment type is a credit card and you can select "yes" or "no" to the prompt. If this field is set to X the check-in will proceed without the prompt "process credit card?" although you may still preauthorize a credit card by clicking the "authorize card" button. Note: You should not both preauthorize and charge the same card at check-in. If this field is set to Y make sure to set "Ask 'Post payment' at check-in?" to N or C.
"Allow check out with balance due?" should be set to N except for special circumstances. If a folio has a balance at the time of check-out, payment should be posted, adjustments should be charged, transactions should be transferred to a different folio, or the balance should be direct billed (if appropriate). The folio balance should be zero once the guest has departed. Folios should not sit with balances once the guest has checked out. Likewise, group master folios should have zero balances after the group has departed, and the master folios should be checked out. "Allow prior day voids?" should be set to N except for special circumstances. Prior-day voids will put you out of balance for the current day (as you cannot "undo" a prior day's activity) and are discouraged in good accounting practices. Adjustments can be posted to prior-day transactions. "Tape Chart Screen Style (C)ondo, (H)otel, sort by (R)oom, (T)ype" determines how rooms are sorted in the Rooms or Tape Chart display. C sorts the rooms in order of usage (lesser-used rooms to most-used rooms). H sorts by room number. R sorts by room number with an additional button at the bottom of the screen, 'Sort by type/ usage' allowing you to sort by room type rather than by room number. Within the type, lesser-used rooms will display before higher-used rooms . When clicked, the button will change to 'Sort by room number' allowing you to change back to sort by room number. T sorts by room type with an additional button at the bottom of the screen, 'Sort by room number' allowing you to sort by room number rather than type. When clicked, the button changes to 'Sort by type/ usage' allowing you to change back to sort by type. "Default room rate code (1-5,W,M,P) sets the default rate code for new reservations and check-in folios. 1-5 are rate codes typically highest to lowest and are defined in Rooms setup and in Room Types setup. W is weekly. M is monthly. P is package. This field defines the default to populate reservations and folios. Rates are set up in Rooms or Room Types. The rate code may be changed individually for each reservation or folio, if the user's security level allows. "Prompt for source of business code?" should be set to Y. "Verify and store guest's company name?" should be set to Y if you use the Corporate File for setting rates and discounts and if you wish to track these. Setting this to Y will disallow the user to enter a company that does not exist. If you do this, you should train staff to look up companies by name rather than simply entering companies; otherwise, you may end up with ABC Company, ABC, A.B.C, and ABC Co for the same company. This happens because the user sees the message that the company doesn't exist (since the user entered a different spelling than is already in the system) and therefore sets up the company new. To use existing companies set up with the appropriate discounts or rates, make sure users look up and select the companies each time. Setting this field to N will allow the user to enter the company name with no verification, which is useful for information purposes. "Force answer to 'split folio'?" should be set to Y if most of your guests are booked by wholesalers, travel agencies, tour companies, etc. This will create two separate folios - one for the room and tax charges and one for the guest's incidentals. The guest typically does not see the primary folio but does see the secondary folio. This setting does not populate the field in the reservation or folio; it simply makes it a required field. When making a reservation or checking in a guest, the user will answer Y in instances where one entity such as a wholesaler is paying for room and tax charges and the guest is paying for incidentals. "Duplicate previous code in charge/payment posting?" can be answered Y if you post several of the same type of transactions in a row. For example, if you are not using Execu/Touch POS and must post restaurant tickets to guest folios, you will find it convenient if the system remembers the prior code posted so that you do not have to enter it each time. "Force log-in for each transaction posting?" should be set to Y if more than one person uses the same workstation and the users do not log out between transactions. Setting this field to Y will require each user to enter his or her ID when posting transactions, making the users more accountable and allowing the auditor to more easily track activity. "Allow group market segment for each room type?" should be set to N unless it is common for members of the same group to belong to different market segment types. Setting this field to Y will require the user to enter the appropriate market segment code for each room type for the group when entering room blocks. "Allow more group rooms picked up than blocked?" if set to Y will allow more rooms to be reserved than are blocked of this type for the group, regardless if rooms are available or not. If set to N the user will not be able to pick up (reserve) more rooms of each type than are blocked for the group for each day blocked. "Default comp market segment" and "Source of business" allows you to enter a default market segment code and default source of business code for COMP guests. COMP is defined as a guest whose rate code is 6 (regular comp) or 7 (condo owner comp). "Interfaces active? (X=yes, Z=no)" Should be set to X even if you do not have interfaces. "General ledger/ A/R Update terminal (1-8)" determines the workstation/terminal number to which the general ledger and direct bill (city ledger) transactions will go. Both general ledger and direct bill transaction batches should be updated daily or as often as possible, so it is important that they reside on the computer of the person processing general ledger or direct bill. Note that the terminal setting must be one digit, 1 through 8. The terminal numbers for batch purposes cycle after terminal 8 and duplicate terminal switches can occur since all terminal numbers correlate to 1, 2, 3, 4. 5, 6, 7, or 8. Therefore you must be careful when general ledger or city ledger is processed at more than one workstation. See the table below. Only one terminal number should be selected from each column when assigning terminal numbers to GL and DB users. See the table to the right, on this page. Find your terminal number on the table to the right. Note the number at the bottom of the column on which your terminal number is listed. The number you noted goes into "General ledger/ A/R Update terminal (1-8)". For example, if your Execu/Tech Terminal is 36, then you would put 4 in the field. "Days to keep reservation history" sets the number of days to keep reservation history before it purges automatically. This field allows three digits. Set it to 999 for history not to purge. Most hotels set this to 180 but you can set it appropriately for your property. NOTE: Reservation History contains only past no-show and cancelled reservations. Current reservations and reservations checked in do not go into Reservation History. Checked in reservations will be in-house or in Guest History. NOTE: Once a past no-show or cancelled reservation drops from Reservation History, that reservation information will not display in the guest's Profile 'View Stays' list. However, the profile will still exist until deleted. Profiles are considered permanent. "Night audit cut-off time (0000:2400)" determines the time that Post Room and Tax and Night Audit Reorganize Files must be performed in order to post automatic room & tax charges, close the business day and create statistics files. The time should be in military (2400) format. Default is 1600. This means that you have until 4:00pm to do night audit for the previous day and you cannot do today's audit until after 4:00 pm. For example, if you perform night audit November 15 at 3:00 pm, room and tax charges will post at 11:55pm on November 14 and your payment, revenue, and occupancy statistics will go on November 14, even for transactions posted on November 15. On the other hand, if you perform night audit November 15 at 5:00 pm, room and tax charges will post at 11:55pm on November 15 and your payment, revenue, and occupancy statistics will go on November 15, even for transactions posted on November 14 subsequent to the previous day's audit. The audit for November 14 may be done any time between 4:01pm on November 14 and 3:59pm on November 15. "Exclude comps from room occupancy in stats?" determines how comp statistical data is stored and prints on the Daily Report and the AM Report. 'Comp' is defined as a guest with either Rate Code 6 or Rate Code 7. Example: If you have ten rooms and all ten are occupied - nine with rate code 2 at $100 each and one with rate code 6, you have 10% occupied by comp guests. If this field is set to Y then your Daily Report will show 10 rooms rented, and Average Daily Rate of $90, Room Revenue PAR at 90 and Occupancy Percentage of 100. If this field is set to N then your Daily Report will show 10 rooms rented, Average Daily Rate of $100, Room Revenue PAR at 90 and Occupancy Percentage of 90. The information will be similar on the AM Report but will have additional statistics for the Market Segment Analysis and the Source of Business Analysis. If this field is set to Y then both analyses will exclude the comps from number of rooms rented and percentage of rooms rented. NOTE: This setting in the Parameter Record applies to occupancy. The AM Report has an additional option to 'average comp rooms into average daily rate'. This option may be checked when 'Print AM Report' is selected from the Night Audit Menu. "Days to keep no-show reservations" can be set to 0 or 1. See also "Days to hold room for no-shows" below. No-show reservations without deposits will move to Reservation History and will no longer be active when Reorganize Files is run at Night Audit. You may set this to 1 to keep the reservation one additional day. This often is done at properties with guests frequently arriving after Reorganize Files has been performed so that guests can still be checked in from their reservations. If this field is set to 0, then the reservation will go to History on the expected arrival date when Reorganize Files is done. NOTE: A reservations with an advance deposit will not go into Reservation History until the deposit has been zeroed out. 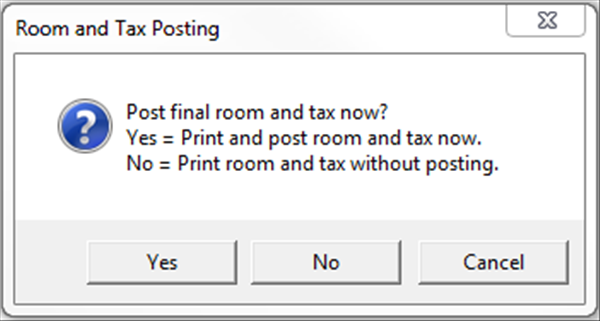 "Default answer to 'Final room and tax'" sets the DEFAULT answer (Y or N) to the prompt displayed at 'Post Room and Tax'. The night auditor may select Yes or No; this parameter setting merely makes the DEFAULT Yes or No when the message displays. When the message displays the auditor may select Y to post room, room tax, auto-post, and package charges for all guests. The results will print. The auditor may select N to print the anticipated results but not post - allowing the opportunity to review for accuracy. The auditor would then run 'Post Room and Tax' answering Y the second time if everything is accurate. Below is the prompt that the audit will see. "Print FINAL Charge and Payment Journal?" if set to Y will print automatically a final Charge and Payment Journal after Reorganize Files has run. This is advised so that any charges or payments posted after the auditor manually printed the journals will print on the final journals. Reorganize Files closes the business day and opens a new day; any charges or payments posted after will be on the next day's journals. If this is set to N, then the auditor can post transactions after printing the journals and those transactions will not be visible on those journals since they were printed prior to posting. "Days to hold room for no-shows" can be set to 0 or 1. See also "Days to keep no-show reservations" above. Set to 1, no-show reservations will stay active one day after their expected arrival dates AND the room will be held. "Multiple Properties?" can be set to Y if you have more than one property sharing this database. Execu/Suite allows up to 99 companies within the one database. If you would like to view each property's rooms on the tape chart you can set this to Y. Then, when viewing the tape chart from any company you may display a specific company or all companies. "Property (company) codes" is a list of companies you wish to view on the tape chart. Each company code should be a two-digit number such as 01 or 05. To view more than one company, "Multiple properties" should be set to Y. "Site specialty code (optional)" should be left blank unless advised by Execu/Tech or you are setting up a marina or RV park in which case you will enter M in the field. "Enhanced housekeeping?" if set to Y requires you to assign Housekeeping Codes to each guest. These codes print on the Housekeeping Report so that housekeeping staff will know when to provide service, such as daily or at check-out only. If this is set to Y at least one housekeeping code must exist. If this is set to N then the 'housekeeping code' field is skipped at check-in. Entering X in this field will allow you to check guests into dirty rooms without a popup notification that the rooms are dirty. "Yield management?" set to Y allows additional parameters for rate and package availability to be set using Yield Management settings. "Display non-inventory rooms?" if set to Y will display non-inventory rooms on the Tape Chart. A non-inventory room is one with 'include in count?' set to N in the Rooms setup. "Post zero invoices to travel agencies?" if set to Y will create travel agency invoices even if the amount is zero such as when a room is comp. If blank or set to N then travel agency invoices will be created only if there is an amount to post. "Save/ Update" will save your changes and exit the screen. You can click the button or press Alt+A on your keyboard. Press on your keyboard to exit without saving. "Print Options" will open a new window described below. "Passwords" will open a new window described below. "System options" is for older systems and is no longer used. 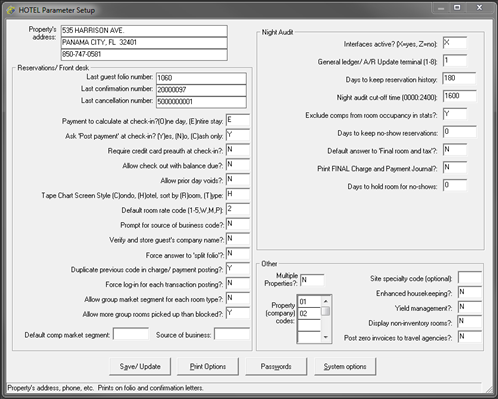 The Print Options button on the main Parameter Record screen opens the following window. "Folio disclaimer" is where you may add disclaimer lines to print on the folio. You also may edit the folio using Notepad or an HTML document editor. NOTE: You should NOT use Microsoft Word® to edit any Execu/Tech document other than those used in the Events/Catering module. Word inserts code that will cause the HTML document not to print properly. "Folio size" is set by default to 7. "Form feed on folios?" should be set to N unless you are using an older dot-matrix printer. "Hotel info printed at top of folio" defines the information you want to print in the Name & Address section of the folio. A will print the hotel's name and address. Y will print the hotel's name only. A number 1 through 9 will print blank lines instead of the hotel's name and address and is the setting to use if your folios print on letterhead paper rather than blank paper. "Balance to print on DB folios" should be set to F so that only that folio's balance prints. If set to A then DB account's balance will print on the guest folio. This is not recommended. If set to L then the folio's balance less DB payments will print. 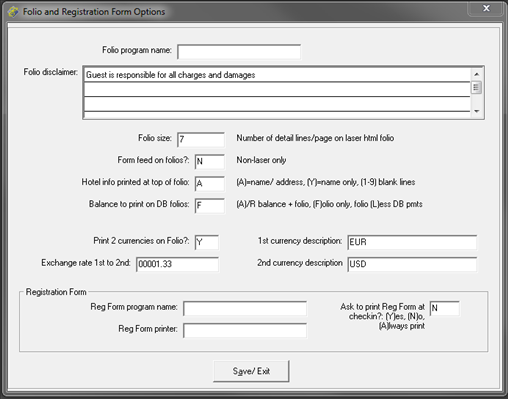 "Print 2 currencies on Folio" should be set to Y if you wish two currencies to print in the 'Balance Due' section on folios. For more options use the MENUINI.FIL setting. "Exchange rate 1st to 2nd" is the rate that Execu/Suite uses to calculate the second currency. For example if your first currency is EUR and your second currency is USD and the current exchange rate is 1.33 you will enter 1.33 in the field as shown below. "1st currency description" and "2nd currency description" defines what will print on the folio as shown below. "Reg Form program name" should be left blank unless advised. "Reg Form printer" is no longer used and should be left blank. "Ask to print Reg Form at checkin? (Y)es, (N)o, (A)lways print" will automatically print the registration form at check-in if set to A. If set to Y a message, "Print Registration Form" will display at check-in, allowing you to answer Yes to print or No not to print. If set to N, a registration form will not print and no message will populate asking if you wish to print. "Save/ Exit" will save your changes and exit the screen. You can click the button or press Alt+A on your keyboard. Press Esc on your keyboard to exit without saving. The Passwords button on the main Parameter Record screen opens the following window. "Overbook password (reservations)" may be up to 8 alphanumeric characters and applies to users attempting to reserve more rooms than are available for that type. If this field is blank, users may overbook without a password. "Overbook password for bookings by room (reservations)" may be up to 8 alphanumeric characters and applies to users attempting to reserve a room number that is already booked. If this field is blank, users may overbook without a password. 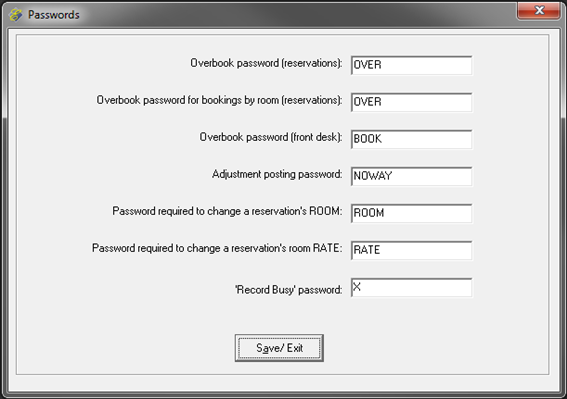 "Overbook password (front desk)" may be up to 8 alphanumeric characters and applies to users attempting to check a guest into a room when no rooms of that type are available. If this field is blank, users may overbook without a password. "Adjustment posting password" may be up to 8 alphanumeric characters and applies to users attempting to use the "Adjustment" function on the Post Charge/Payments screen. If this field is blank, users may post an adjustment without a password. This same password may be applied to voids using MENUINI.FIL if voids are allowed in the user's security level settings. "Password required to change a reservation's ROOM" may be up to 8 alphanumeric characters and applies to users attempting to make a room assignment change in a reservation. If this field is blank, users may continue without a password. "Password required to change a reservation's room RATE" may be up to 8 alphanumeric characters and applies to users attempting to change a reservation's room rate. If this field is blank, users may continue without a password if room rate changes are allowed in the user's security level settings. "'Record Busy' password" may be up to 8 alphanumeric characters and applies to users attempting to access a folio or reservation with a "Guest Record Busy" or "Reservation Busy" message. This prevents two or more users trying to add to or change the same record. The System options button on the main Parameter Record screen is for older systems and is no longer active.